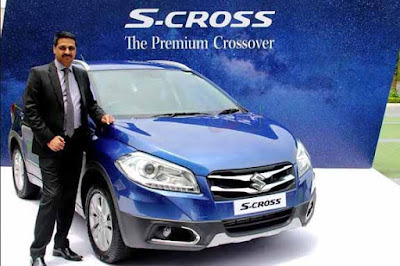 Jaipur : Maruti Suzuki India Limited on Friday presented India's first premium cross-over, S-CROSS here today. Its bold cross-over looks, premium interiors and rich features enable the S-CROSS to stand out. It is offered in two diesel engine options: DDiS 200 and DDiS 320. Maruti Suzuki making another effort to be a credible player in the premium segment where its performance has been dismal when compared with its enormous success in the mass-car market. The S-Cross is offered in all-diesel variants and priced starts from Rs 8.57 lakh - Rs 14.09 lakh (ex showroom) in Jaipur. The vehicle, developed at an investment of Rs 600 crore, would be sold through the new exclusive NEXA sales outlets. Vinay Pant, Head of Marketing Maruti Suzuki India said that, "We have got a good initial response from the market. We are targeting the premium segment for the first time as a 45 per cent market share in the passenger vehicles market leaves us vying for the other 55 per cent of market currently not with us." The combination of massive torque, power and superior ride and handling is bound to delight customers. By offering power and performance, and the comfort and refinement of a sedan, S-CROSS creates the new category of “premium cross-over” in India. S-CROSS will be the first model to be retailed exclusively through NEXA, the new automotive experience launched recently. Clearly, S-CROSS is above the ordinary! There is a segment of customers in India who want power and performance in their vehicle, but also the comfort and refinement of a sedan. It is in that spirit that S-CROSS is being launched today. Built on a brand new platform, its bold cross-over shape, dynamic character lines and many sophisticated touches contribute to its distinct look and emotional appeal. The interiors are plush, upmarket and spacious with high quality fit and finish and top notch features. Powered by DDiS200 & DDiS320, S-CROSS will delight customers with its massive torque, power and superior ride and handling. Words alone do not do justice to the S-CROSS. It has to be driven to be experienced. The Prices (Ex Showroom Jaipur) are ..